After one year of rebuilding lives destroyed by addiction, Narconon Tijuana staff, students and supporters pause to celebrate the success of this long-term rehab facility. The Padre and all of his dedicated staff are bringing the addicted back to life every day and we’re grateful to have them on our team. It was an anniversary event marked by singing, music, visiting families, television coverage and joy. On Friday, August 15th, Narconon Tijuana, a residential, long-term drug rehab program, celebrated its first birthday with a hundred neighbors, graduates, family members and other guests. Narconon Tijuana was founded in 2012 by Padre Jaime Lares after he was introduced to this successful drug rehab program that originated in Arizona in 1966. Now with more than a hundred rehab and drug prevention centers around the world, Narconon offers a method of getting the addicted through a tolerable withdrawal, followed by a drug-free rehab protocol that builds sober living skills. When he first opened his new center, Padre Lares appointed Juan Verdugo who had been Executive Director of the earlier twelve step program, Casa del Reencuentro–. Verdugo credits the Narconon program with the restoration of his life after he lost everything to a severe addiction to cocaine. After mass at the Catholic Church next door, Padres Lares, Verdugo, and many friends of Narconon gathered to share stories of success and make plans for the expansion of the Narconon program in Mexico. In attendance from Narconon International in Los Angeles were Clark Carr, president, and Jose De Carpio, along with volunteer Laura Capaceta. 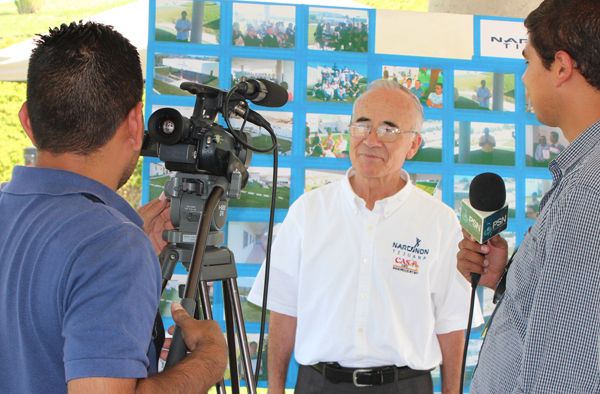 The local newspaper and television station were on hand to report this positive news of the recoveries that have been achieved at Narconon Tijuana. "We are so proud of the work being done here by Padre Lares and his team," said Carr. "Our program is all about restoring mental, physical and spiritual strength to those who had lost all integrity due to addictions. The Padre and all of his dedicated staff are bringing the addicted back to life every day and we’re at grateful to have them on our team." As reported by the Pulitzer Center, the numbers of the addicted in Tijuana have been growing for the past few years as drugs sit along the border, waiting for their moments to cross into the US. Some of the supply of heroin, cocaine or methamphetamine gets diverted into the hands of the locals. Additionally, cheaper, inferior drug supplies are slated for addicts within Mexico while purer drugs continue on their way to the US and other countries with an appetite for intoxicants. The San Diego Reader noted that many Tijuana rehab facilities are hand-built by generous individuals who simply want to help the hundreds of thousands of people who have lost their way. That is how Padre Lares built Narconon Tijuana – it’s a clean and beautiful center but simple, built by the Padre and his friends. After the anniversary celebration, Narconon International staff planned to offer a two-day training workshop to staff from more than forty Twelve Step rehab centers in Tijuana, to provide them with improved withdrawal methods. For more information on the Narconon system of drug recovery, call 1-323-962-2404.